The Maverick Vigilance Program is a dedicated design installation surveillance program that collects and assesses reports of suspected adverse failures of products and or installations. This program enables Maverick Integration to monitor the safety and health of products and systems so to optimize the performance of the client systems during and after deployment. Maverick Integration has tracked product and installation methods for a period of over ten years and have compiled reports of suspected adverse reactions in systems due to installation or product specific deficiencies. The Maverick Integration staff are consistently testing and reporting on installation and a full time Construction Manager evaluates the installation and product performance to insure overall reliability and above expectation performance. Our proprietary Vigilance Station is housed at our headquarters and showroom, in Nashua, NH. This is where we master comprehensive system design, fully assembling and relentlessly testing every component of your build before we install it. MVP status means you receive dedicated, 24/7 remote system monitoring and on-call client support, meaning that we are available to address any issue or question you might have, around the clock. Our systems are installed with a patented “machine-learning” process that allows us to preemptively address many common issues that would otherwise require a service visit. This means that we can almost anticipate an issue and fix it before you would even have noticed. Maverick Network Operations Control (NOC) Center in Nashua, NH. Our expert technicians monitor Maverick systems around the clock. 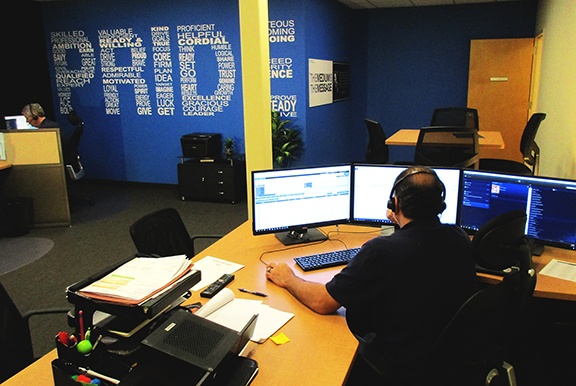 We take so much pride in our NOC Center and Vigilance Program that we had to make it a part of the room itself.